This spring, the hubs and I took a trip to the Northeast. On our first night in Boston, we stopped in for a delicious dinner. A sign on the wall in the restaurant caught my eye. "Salty", it read. I had to stop and snap this picture, because this statement was one I heard quite a bit from my very own high school students. But for some reason, on this particular day, and in this particular place, I thought about the word a whole lot differently. I recognize that not all of you may spend the large amount of time around high schoolers that I do (as a teacher, YoungLife leader, and coach), so I'll help you out if this word means nothing but a spice to you. In today's lingo, being salty means that you are upset or bitter. For example, if I gave kids a hard time about doing their work, they'd respond with something like this: "Klein, you're so salty today!" or "Mrs. K, you're still salty about the Royals' loss last night." Strange, I know. But this is what the kids are up to these days. God bless 'em. The salt of the Earth, huh? Think about what salt is and has been used for: flavor and preserving. Just as salt was used to keep food good and to offer it flavor, Christians are called to do the same. To enhance the earth with a positive influence, and to preserve the good in it from the wicked ways of man. To maintain a focus on the Lord and His will for us all. 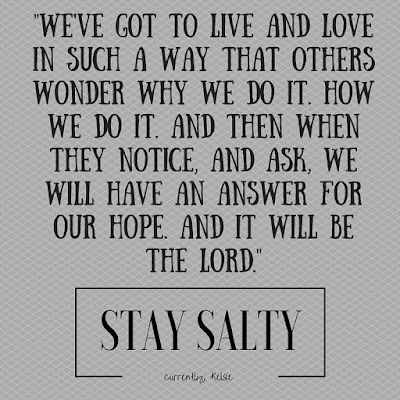 You see being "salty" is a good thing- something we are called to. By following the Beatitudes and the Word of God, we become "salty" in a whole new way. We have the ability to help prevent the moral decay around us. The call to look different, and to be set apart in our words, deeds, and love for others. But we are cautioned in the passage above that if we lose our saltiness, we are no longer "good for anything". In fact, the very effect of our saltiness is lost if we become like this world. We are not called to be like the world, but instead in it and set apart from it. Our very influence for the kingdom depends deeply on our ability to be distinct, instead of identical. This isn't always easy. We're human. We mess up. We can't save ourselves, but instead depend fully on the Lord and His loving grace. But we've got to remember to be salty. To be set apart, a light in the darkness, a city on the hill. We've got to live and love in such a way that others wonder why we do it. How we do it. And then when they notice, and ask, we will have an answer for our hope. And it will be the Lord. We are salt and light. We are tasked with moments day after day where we can look like the world, or be set apart. 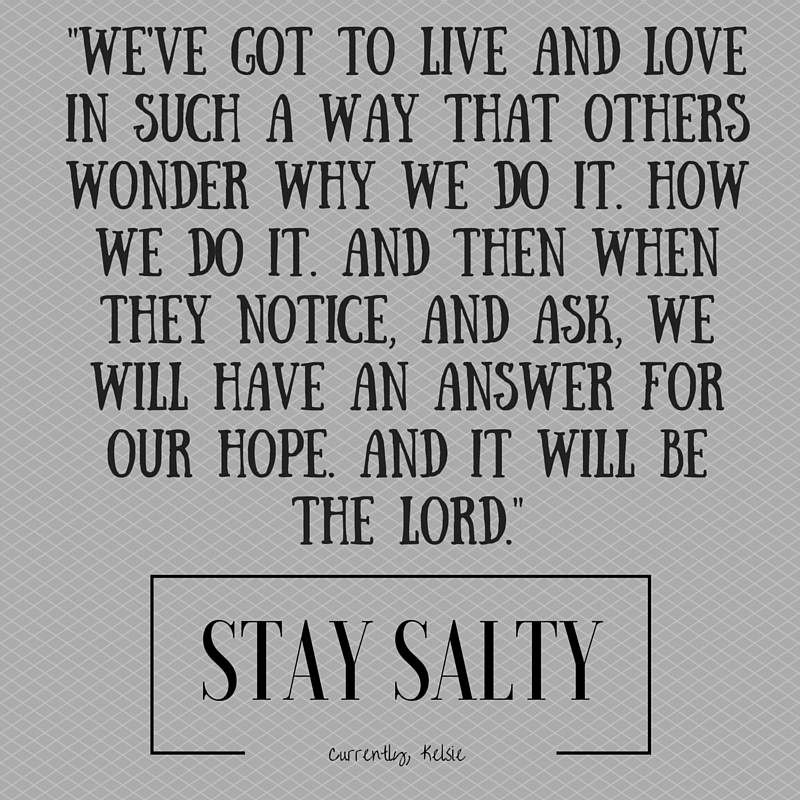 Where we can choose to live out our faith, or lose our saltiness. So I'm adopting this mantra: stay salty. Choose life. Choose the Lord. Choose to look and love in a different way. We are the salt and light of this world, friends. Let's not forget it. Stay salty. Oh, I LOVE how you've blended these things! YES--I hear the younger people I work with using the 'salty' term all the time. Thanks so much for the reminder that it's a good thing to be salty! :) Blessings! Great post! 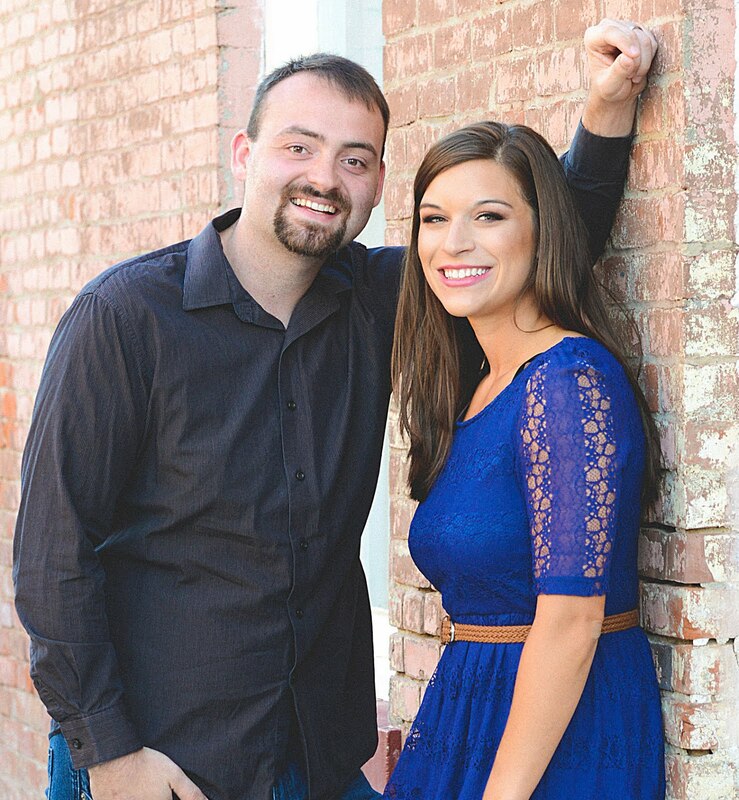 Speaking of Salt, Iowa State has a dynamic student ministry called The Salt Company. And, it's headed to Mizzou! Maybe your SIL would like to check it out! Oh wow, that's awesome!! Thanks so much for sharing Casey!! I like your perspective on this :) And I am a secondary teacher and teacher leader, too. Teenagers are awesome! Thank you, Kelli! I agree- I really enjoy them a lot! Ha! Thanks, Susannah! It just struck me! I've never heard the term Salty as used by the high school kids but it's interesting how they interpret the word. I love how you take it from being something negative to being something positive. Your perspective is so inspiring and your correlations between the salt of the Earth and us, as God following people! I work with teens a lot and have never heard the term--American slang tends to be a little delayed in making it to the other side of the world, so it'll probably be here in a couple years, haha!! I absolutely love the Bible verse connection you made! We should be salty indeed! Ha! Love that. Salty for the win! I love love how you took a current slang and brought it back to Christ. I agree completely... STAY SALTY. Thank you, thank you Stephanie! Let's do it! I love the connection you made! Who knew high school students were on the brink of such wisdom? 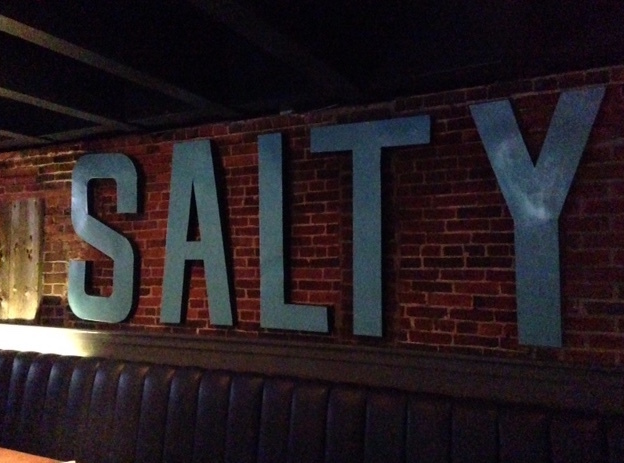 I have never heard the slang term salty before (shows how up to date I am!) but yes it should be a good thing! For sure- I totally get it ha. I'm just around these kids all of my days! YES, YES, YES. Love this post, Kelsie!! One of my "life verses" is Colossians 4:6: "Let your speech always be gracious, seasoned with salt..." I have learned that we can't speak with only grace, but we can't speak with only salt, either. There has to be a balance, which is discerned by situation and conversation. I cringe when Christians are just all about the grace, when there is a biblical need for the saltiness (blunt or tough love, as I put it). Great post! Oh I LOVE that, Summer! Thanks so much for sharing- I actually did look at that verse when I was preparing this verse. A balance is so huge for sure- thanks for sharing such wisdom with us, and for reading :) Also, I LOVE your tattoo with your wedding date. So awesome! Aww, well thanks so much Heather! You rock! !